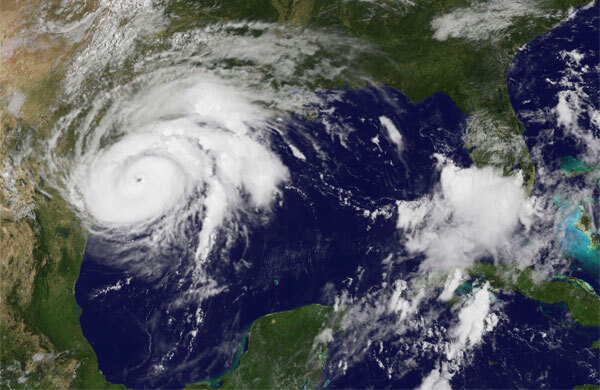 Here in San Antonio, grocery stores were packed with families stocking up on water and canned food in preparation for Hurricane Harvey, which has devastated Houston and coastal Texas towns. I hope everyone who lives in its path took the necessary precautions to stay safe and dry—this storm was definitely one to tell your grandkids about one day. Similarly, I hope investors took steps to prepare for some potentially disruptive economic storms, including this past weekend’s central bank symposium in Jackson Hole, Wyoming, and the possibility of a contentious battle in Congress next month over the budget and debt ceiling. As you’re probably aware, central bankers from all over the globe visited Jackson Hole this past weekend to discuss monetary policy, specifically the Federal Reserve’s unwinding of its $4.5 trillion balance sheet and the European Central Bank’s (ECB) ongoing quantitative easing (QE) program. Janet Yellen gave what might be her last speech as head of the Federal Reserve. As I told Daniela Cambone on last week’s Gold Game Film, there are some gold conspiracy theorists out there who believe the yellow metal gets knocked down every year before the annual summit so the government can look good. I wouldn’t exactly put money on that trade, but you can see there’s some evidence to support the claim. In most years going back to 2010, the metal did fall in the days leading up to the summit. Gold prices fell most sharply around this time in 2011 before rocketing back up to its all-time high of more than $1,900 an ounce. Many of the economic and political conditions that helped gold reach that level in 2011 are in effect today. That year, a similar Congressional skirmish over the debt ceiling led to Standard & Poor’s decision to lower the U.S. credit rating, from AAA to AA+, which in turn battered the dollar. 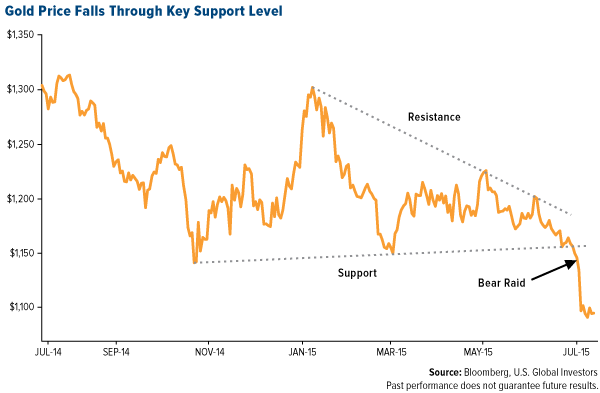 The dollar’s recent weakness is similarly supporting gold prices. In August 2011, the real, inflation-adjusted 10-year Treasury was yielding negative 0.59 percent on average, pushing investors out of government bonds and into gold. Because of low inflation, we might not be seeing negative 10-year yields right now, but the five-year is borderline while the two-year is definitely underwater. Bank of America Merrill Lynch sees gold surging to $1,400 an ounce by early next year on lower long-term U.S. interest rates. Are Government Inflation Numbers More “Fake News”? If we use another inflation measure, though, yields of all durations look very negative. For years, ShadowStats has published alternate consumer price index (CPI) figures using the methodology that was used in 1980. According to economist John Williams, an expert in government economic reporting, “methodological shifts in government reporting have depressed reported inflation” over the years. The implication is that inflation might actually be running much higher than we realize, as you can see in the chart below. If you believe the alternate CPI numbers, it makes good sense to have exposure to gold. 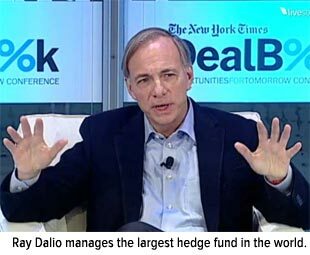 Recently I shared with you that Ray Dalio—manager of Bridgewater, the world’s largest hedge fund with $150 billion in assets—was one among several big-name investors who have added to their gold weighting in recent days on heightened political risk. That includes Congress’ possible failure to raise the debt ceiling and, consequently, a government shutdown. Dalio recommends as much as a 10 percent weighting in the yellow metal, which is in line with my own recommendation of 10 percent, with 5 percent in physical gold and 5 percent in gold stocks, mutual funds and ETFs. I urge you to watch this animated video about opportunities in quality gold mining stocks! The U.S. media certainly wants you to believe that Trump is bad for the dollar. 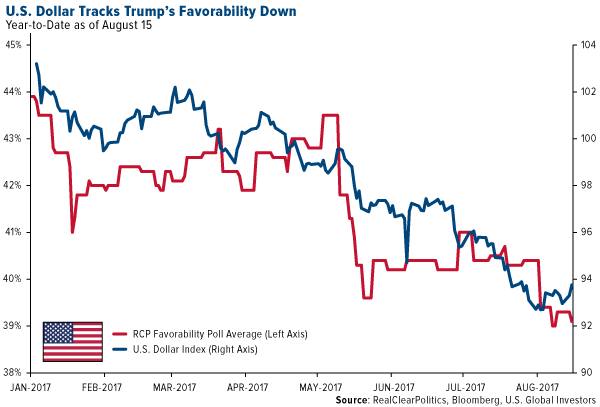 Take a look at this chart, showing the dollar’s steady decline alongside President Donald Trump’s deteriorating favorability rating, according to a RealClearPolitics poll. However, a weak dollar is good for America’s economy. I’ve commented before that Trump likes a falling dollar, because it is good for the country’s export trade of quality industrial products. It’s also good for commodities, which we see in a rising gold price and usually energy prices. Ready for a Big Fight? You might have watched the Mayweather vs. McGregor fight, but have you been watching the fight between Trump and the Fed? At the symposium in Jackson Hole, Fed Chair Janet Yellen squared up directly against Trump when she defended the strict regulations that were put in place after the financial crisis. Echoing these comments was Dallas Fed chief Robert Kaplan. This is the opposite of what Trump has been calling for, which is the streamlining of regulations that threaten to strangle the formation of capital. It’s important to recognize that the market is all about supply and demand. The number of public companies in the U.S. has been shrinking, with about half of the number of listed companies from 1996 to 2016. Readers have seen me comment on this previously, and I believe that the key reason for this shrinkage is the surge in federal regulations. The increasingly curious thing is that we are seeing the evolution of more indices than stocks, as the formation of capital must morph. As I told CNBC Asia’s Martin Soong this week, there is a huge amount of money supply out there, and investors are looking for somewhere to invest. The smaller pool of stocks combined with the greater supply of money means that the market has seen all-time highs. In addition, major averages were regularly hitting all-time highs not necessarily on hopes that tax reform would get passed, but on strong corporate earnings, promising global economic growth and the weaker U.S. dollar. Meanwhile, small-cap stocks are effectively flat for 2017 and heading for their worst year since 1998 relative to the market, according to Bloomberg. 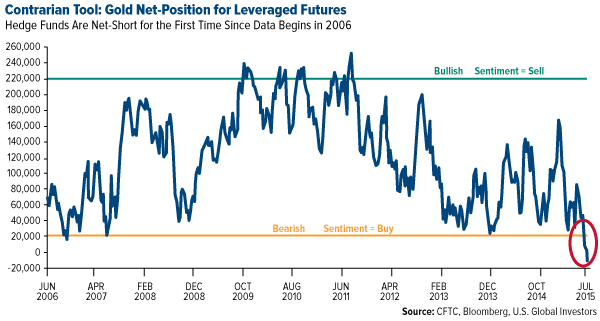 Hedge funds’ net short positions on the Russell 2000 Index have reached levels unseen since 2009. Remember, these are the firms that were expected to be among the biggest beneficiaries of Trump’s “America first” policies. However, the weakness in U.S. manufacturing has a great impact on the growth of these stocks, as indicated by the falling purchasing managers’ index (PMI). The slowdown in manufacturing is offset by strength in services, shown by the Flash composite PMI score of 56.0 which came out this week. Though there is a spread between large-cap and small-cap stocks, historically this strong score is an indicator of growth to come. Some big-name investors and hedge fund managers are turning cautious on domestic equities in general. On Monday, Ray Dalio announced on LinkedIn that he was reducing his risk in U.S. markets because he’s “concerned about growing internal and external conflict leading to impaired government efficiency (e.g. inabilities to pass legislation and set policies).” Pershing Square’s Bill Ackman and Pimco’s Dan Ivascyn have also recently bought protection against market unrest, according to the Financial Times. 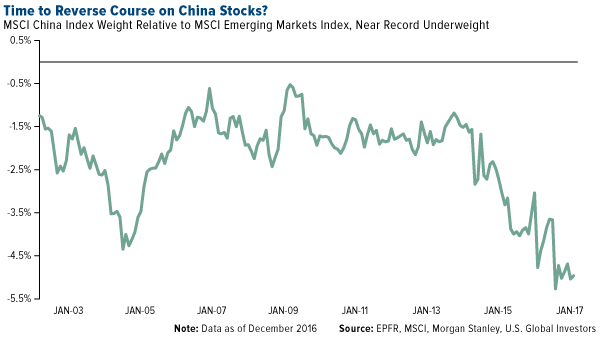 Chris Wood is overweight Asia and emerging markets. It’s important to keep in mind that there will always be disruptions in the market, and adjustments to your portfolio will sometimes need to be made. For those of you who read my interview with the Oxford Club’s Alex Green, you might recall his “Gone Fishin’” portfolio, which I think is an excellent model to use—and it’s beaten the market for 16 years straight. Green’s portfolio calls for not just domestic equities, Treasuries and bonds but also 30 percent in foreign stocks and as much as 10 percent in real estate and gold. Many short sellers of Weight Watchers no doubt felt too down to look in the mirror this week after company stock unexpectedly ballooned nearly 170 percent. You can thank (or blame) Oprah. The influential former talk show hostess bought a 10 percent stake in the weight management company, sending its shares up from $6.79 to $18.25 in as few as two trading sessions. This is hardly the first time one of Oprah’s endorsements, whether verbal or monetary, has lifted a struggling business or product. 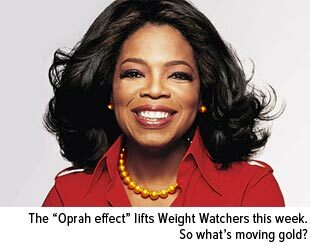 There’s even a name for it: the Oprah Effect. No matter your opinion of Oprah—her politics, her tastes—you have to admit that she’s a phenomenally savvy businesswoman, whose rags-to-riches success has helped make her one of the most powerful women in not just the U.S. but the world. As such, it’s important for investors to pay attention to her and other such “smart money” influencers. Their decisions often have the power to move markets. So what’s moving gold right now? But as I discuss in a previous Frank Talk, perhaps the most significant mover of gold right now is the weakening of the strong U.S. dollar against other world currencies. Gold and the dollar share an inverse relationship, and for the past year, the greenback has been putting pressure on the yellow metal, not to mention other commodities and natural resources. Now that the dollar is showing signs that it’s starting to turn, however, gold is starting to turn heads. Watch my video below for further insight into what’s moving gold. The leveraged gold futures derivatives market is knocking down the precious metal, yet in massive contrast, this drop has ignited a shopping frenzy according to gold coin dealers. I spoke with several friends and industry experts last week who confirmed the record sales numbers for the month. In fact, American Gold Eagle sales reached 161,500 ounces in July, the highest monthly figure since April 2013. What gives? Gold often attracts conspiracy theories when it falls so abruptly, especially on Mondays. Interestingly, in a recent article on Zero Hedge, ABC Bullion out of Sydney, Australia, details some of the speculation behind the precious metal’s beatdown, which I’ve also discussed in my blog. Price manipulation, or a “bear raid,” could be a factor. Last week, gold prices experienced a mini “flash crash”—the first one in 18 months—after five tonnes of the metal appeared on the Shanghai market. Whether front-running or fat fingers are to blame, the sell order for what many are calling a bear raid was initially thought to have originated in China, but we now believe it came from New York City. 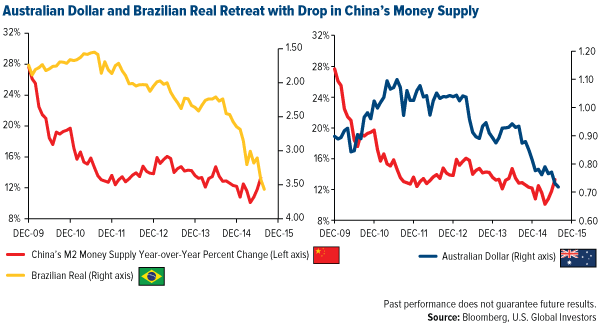 Did investors anticipate China’s negative flash purchasing managers’ index (PMI) last week? China is the largest consumer of gold, and the PMI is a useful leading indicator of commodities demand as well as job growth. What about the Greek crisis? This type of debt fear crisis often has the effect of boosting the price of gold, but we didn’t see that happen. Did European central banks sell gold down to dampen the psychological impact of the event? Understating the seriousness of the debt crisis may have prevented investors from seeking gold as protection. Conspiracy theories or not, I believe none of this tarnishes gold’s sustainable allure. It’s important to look at the two key demand drivers for gold: the Fear Trade and the Love Trade. The Fear Trade is related to money supply and negative real interest rates. The Love Trade comes from the purchase of gold due to cultural affinity and the rising GDP per capita in Asia and the Middle East. I’ve always advocated, and continue to advocate, a 10 percent weighting: 5 percent in gold stocks and 5 percent in bullion, then rebalance every year. Take a look at the chart, which shows that the bearish trend is obvious. And yet many investors are still buying. In an interview this week with Money Metals Exchange and in talking to Bart Kitner, founder of Kitco, both conversations confirmed that smart investors are enthusiastically buying gold during this downdraft in prices. With so much gloom and doom in the media surrounding gold right now, you might wonder why coin sales are soaring at multiyear highs. The reason is pretty simple: Gold is on sale. High net worth individuals and other savvy investors realize that even now, as herds of people are rushing for the exit, owning gold is one of the best ways to manage systemic risk. They follow that Greeks had their cash in banks frozen like in Cyprus only a few years ago. Indeed, some investors fail to take a long-term perspective on gold. Their sentiment toward the metal extends only as far back as the most recent selloff, induced by the strong U.S. dollar, weak global manufacturing activity and fears that interest rates will soon rise. 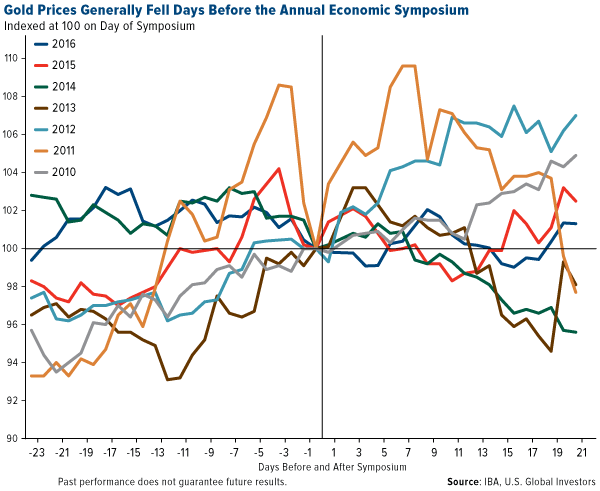 Many investors have that “sinking feeling” with a deterioration in global PMI, leading economic indicators, falling commodity prices and the threat of rising U.S. interest rates. Many have raised their cash levels due to decelerating global growth prospects. I’ve written that bad news is good news because when governments accelerate monetary policy, this can be a good opportunity for investors to add to their gold exposure. I’m not the only one who takes this position. Besides the investors gobbling up American Gold Eagles, central banks around the world continue to buy, hold and repatriate bullion. The U.S. Federal Reserve maintains its 8,133 tonnes, the most of any central bank. 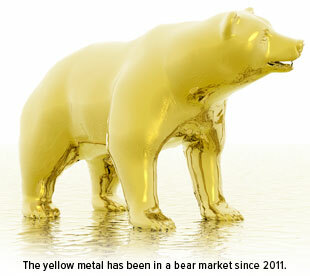 Germany, the Netherlands and other countries have brought home mounds of the yellow metal in the last 12 months. 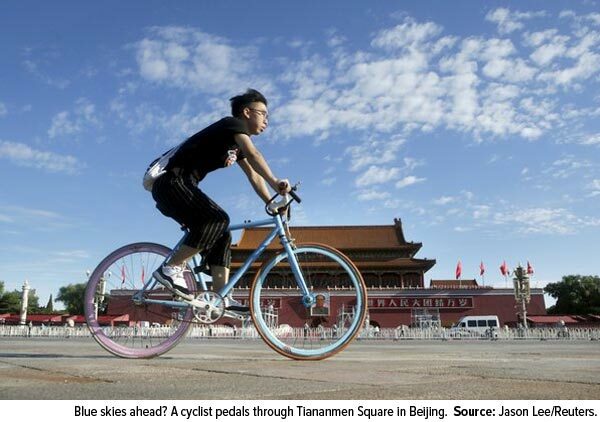 China has increased its reserves 60 percent in the last six years. And Texas is in the early stages of establishing its own gold depository, the first state to do so. If there were no faith left in the metal, why would banks even bother with it? At the same time, massive amounts of paper money are still being printed. In fact, the International Monetary Fund has asked the Bank of Japan to be ready to increase its monetary stimulus further,according to Bloomberg. Let the paper printing roll! In the U.S., where quantitative easing was supposed to have ended back in October, the Fed’s balance sheet is still within 0.3 percent of its all-time high, according to Sovereign Man. Before the bottom fell out, gold’s support seemed to have been around $1,150, whereas the resistance trend line was breaking down. The descending triangle pattern, seen below, indicates that demand was weakening and downside momentum was gathering force. A useful tool that traders and analysts use is Bloomberg’s relative strength indicator (RSI). Below is gold’s RSI over the same one-year period. It shows that gold has passed below the 30 mark into oversold territory. When this happens, many analysts see it as a buying opportunity. Between November 3—the last time gold fell this significantly below 30—and January 20, the yellow metal ended up rallying 13 percent. A similar tool we use to identify buy and sell signals is the price oscillator, which I often explain while speaking at conferences. This tool measures how many standard deviations an asset’s value has moved from its mean (and in which direction). When the number crosses above two standard deviations, it’s often interpreted as an opportunity to take some profits, and when it crosses below negative two, it might be a good time to think about accumulating. 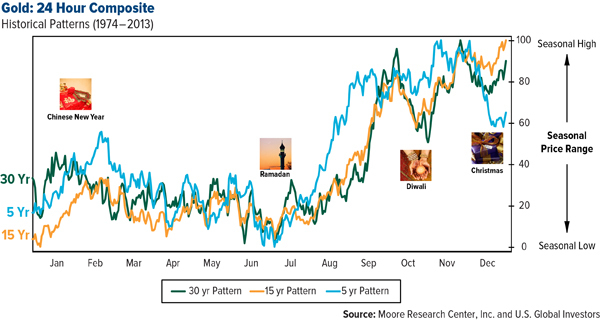 I always look at two demand factors for gold, the Fear Trade and the Love Trade. The Love Trade is the purchase of gold for weddings, anniversaries and cultural celebrations while the Fear Trade is gold’s reaction to monetary and fiscal policies, particularly real interest rates. Historically, the Love Trade has been on the upswing starting around this time—late July and early August—in anticipation of international festivals and holidays such as Diwali, Christmas and the Chinese New Year. 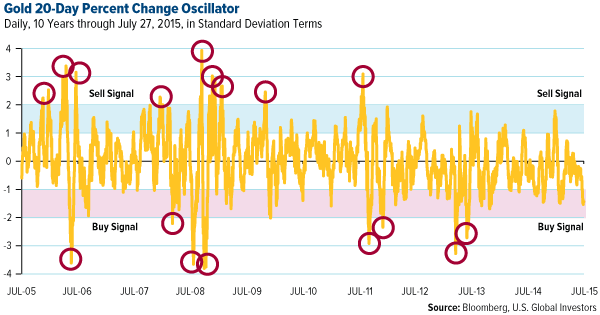 But as you can see in the oscillator chart above, gold is down 1.4 standard deviations for the 10-year period. This suggests gold may be at an attractive level to accumulate, and gold stocks can offer greater beta when gold begins to revert to its mean. The Fear Trade, on the other hand, involves the Fear Trade and real interest rates (inflation – CPI = real interest rates). Several times in the past I’ve explained how gold tends to benefit when real interest rates turn negative. 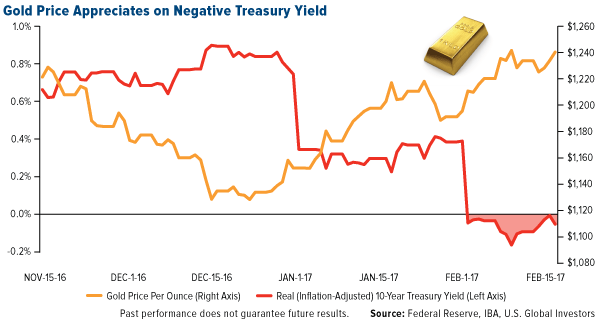 When the rate of inflation exceeds the yield on a five-year Treasury note, it makes gold much more attractive to many investors. 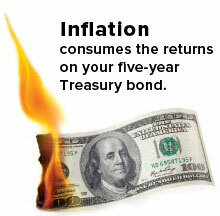 At this time, the five-year Treasury yield sits at 1.58 percent while inflation is crawling along at 0.1 percent. This means that real rates are a positive 1.48 percent—a headwind for gold. As I told Daniela Cambone during last week’s Gold Game Film, the U.S. has some of the highest real rates of return in the world right now. To see gold gain traction again, not only do we need to see negative real interest rates in the U.S. we need to see rising real GDP per capita in China and rising PMI in China. On a final note, there appears to be a battle between the debt markets and equity markets. The debt market yields suggest rates will not be rising next month or quarter, while equity markets suggest they will. I think the bond market is more accurate. With a struggling global economy and commodity deflation odds favor rates will not rise soon in America, and gold will revert back to the mean. Gold Survey estimates that the total amount is approximately 183,600 tonnes, or 5.9 billion ounces. If we take that figure and multiply it by the closing price on June 16, $1,181 per ounce, we find that the value of all gold comes within a nugget’s throw of $7 trillion. More to the point, the gold standard limits the amount of debt that can be issued. Forty-four years ago, when the U.S. made the switch to a fiat currency system, the federal government owed $399 billion.Since then, outstanding debt has ballooned 4,411 percent to $18 trillion—more than twice the amount of all the gold in the world. Such massive debt levels can be reached only in a fiat currency system, where money is easy, virtually limitless and unsecured by anything tangible. How strongly do you agree or disagree with the following statement? Texas is taking the right steps to protect its economic freedom and stability by creating its own gold depository. 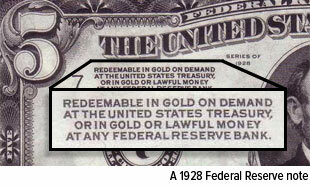 At the time, this was true in every sense of the word “money,” as the U.S. was still on the gold standard. Of course, that’s no longer the case. Despite the fact that previous attempts in other countries to adopt fiat currency systems wreaked havoc on their economies, the U.S., under President Richard Nixon, cut all ties between the dollar and gold in 1971. Gold rose 2,330 percent during the decade, from $35 per ounce to $850. 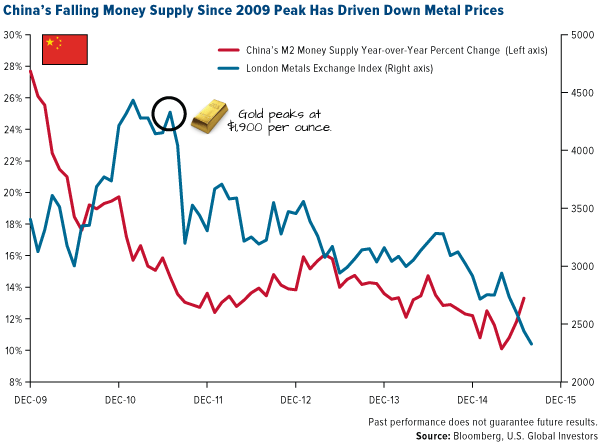 Today, money supply continues to expand while federal gold reserves remain at the same levels. Many people still view the yellow metal as something more than just another asset. They also contend that it’s grossly undervalued. In a recent interview with Hard Assets Investor, author and veteran gold investing expert James Turk explained that the money we use now in transactions is not real money at all but a substitute for gold—real money—which he sees fundamentally valued at $12,000 per ounce. That is to say, if the U.S. government decided tomorrow to return to the gold standard, one ounce of the metal could be valued as high as $12,000, according to Turk’s model. The current fiat currency system in the U.S. is more than 40 years old. That’s much longer than many in the past lasted, including two of the earliest attempts by central bankers Johan Palmstruch and John Law, both of which I summarize below. Some readers might identify more than a few parallels between then and now. In the mid-1600s, a Dutch merchant named Johan Palmstruch founded the Stockholms Banco in Sweden, the first bank in Europe to print paper money. 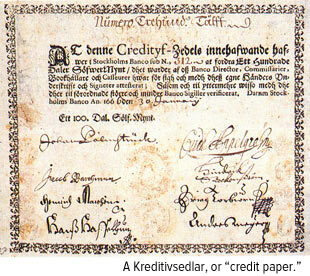 The Swedish currency at the time was thedaler, essentially a copper plate. Palmstruch’s bank began holding these and issuing banknotes, which were exchangeable in any transaction and fully backed by the physical metal. At least, that’s what customers were told. As you might imagine, people found these notes to be much more convenient than copper plates, and their popularity soared. But there was one (huge) problem. Palmstruch had been doling out so many paper bills, that their collective value soon exceeded the amount of metal on reserve. When customers heard the news, a major bank run occurred, but Palmstruch was unable to honor the rapidly-weakening notes. By 1664, a mere three years into his monetary experiment, the Stockholms Banco was ruined and Palmstruch was jailed—just as Bernie Madoff would be three and a half centuries later. A little over 50 years later, in the early 1700s, a similar experiment was conducted in France, with even more disastrous consequences. This time, the perpetrator was a Scottish gambler and womanizer named John Law, who as a young man had been forced to flee Britain after he killed a man in a duel over a love interest—and bribed his way out of prison. After escaping jail time, Law spent 10 years or so gallivanting about Europe and developing his economic theories, which he outlined in an academic paper. It was the Age of Enlightenment, when great iconoclastic thinkers such as Descartes, Locke and Newton emerged, changing our understanding of consciousness, politics and physics. Baroque music was all the rage in Europe, as were composers like Bach, Handel and Vivaldi. It was also a golden age of get-rich-quick schemes, and as investors, it’s important that we be aware of the history of human behavior. In 1715, France was insolvent. It had just lost its king, Louis XIV, and the Duke d’Orléans was named regent until the late monarch’s great-grandson came of age to rule. Familiar with Law and his unorthodox ideas, the duke established him as head of the Banque Générale in hopes that he might reduce the massive debt Louis XIV left behind. To this end, Law began printing banknotes—lots of them—and flooding the economy with easy money. Doing so, he believed, would expand employment, boost production and increase exports. It indeed had those effects—for a time. Paris was booming. The number of millionaires multiplied. Unlike Palmstruch, Law made no claims that the notes could be converted back into gold or any other metal. He believed that a currency, whether gold or paper, had no intrinsic value other than as a government-sanctioned medium of exchange. Instead, his notes were “secured,” vaguely, by French land, including its colonies in the Americas. There was also no limit to the amount of money that could be pumped into the French economy. Like many of today’s central bankers, Law was of the opinion that if 500 million notes were good, a billion were even better. But to make it all work according to plan, he had to take extreme measures. Law outlawed the hoarding of money, the use of coins and the possession of more than the minimalist amount of gold and silver. The system turned out to be untenable and the paper money became worthless. After only four short years, the currency bubble burst. Law was not only removed from office but exiled from the country. 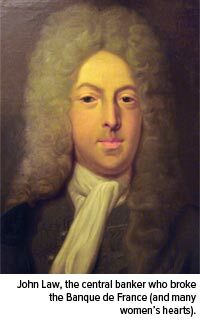 Until his death in 1729, he roamed Europe heavily in debt, making his way by his former occupation, gambling. 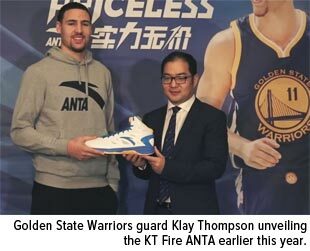 The incident had long-lasting effects. It sustained the country’s economic woes for years and contributed to the start of the French Revolution later in the century, as it stoked working class disenfranchisement. Just as we still read Locke and listen to Bach, we should remember what Palmstruch, Law and other reckless central bankers did—which was essentially pull the rug out from under their countries’ monetary systems. It would be extreme to suggest that a similar collapse in currency might one day happen in the U.S., but it’s worth repeating that the gold supply has not kept pace with the money supply. This could have huge implications. Eventually people are going to understand that all of this fiat currency that is backed by nothing but IOUs is only as good as the IOUs are good. And in the current environment, the IOUs are so big, a lot of promises are going to be broken. Should those IOUs one day become as worthless as Palmstruch’s or Law’s paper—however unlikely that might be—I suspect many readers would feel relieved to know that they had had the prudence to invest in gold. I always advise investors to hold 10 percent of their portfolios in gold—5 percent in bullion, 5 percent in gold stocks, then rebalance every year. Earlier this week, I had the pleasure to appear on Jim Puplava’s Financial Sense Newshour radio program and discuss the state of the gold market. Along with my peers John Doody of the Gold Stock Analyst and Ross Hansen of Northwest Territorial Mint, I shared my thoughts on how we arrived in the current bear market, what factors might help us get out of it and the role real interest rates play in prices. Below I’ve highlighted a few of my responses to Jim’s questions. Q: Let’s begin with the bear market that began in 2011. Two questions I’d like you to answer. Number one: What do you believe caused it? Number two: Do you think this is cyclical or a secular bear market? A: As I often say, two factors drive gold: the Love Trade and the Fear Trade. 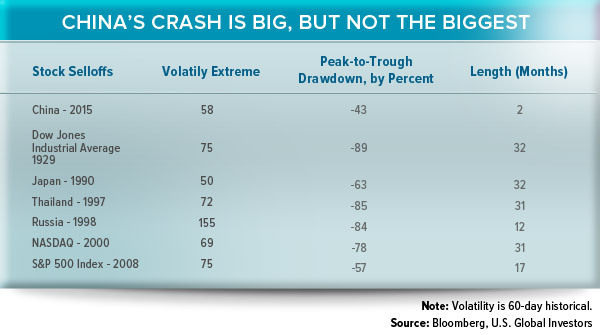 In 1997 and 1998, the bottom of the emerging market meltdown took place. 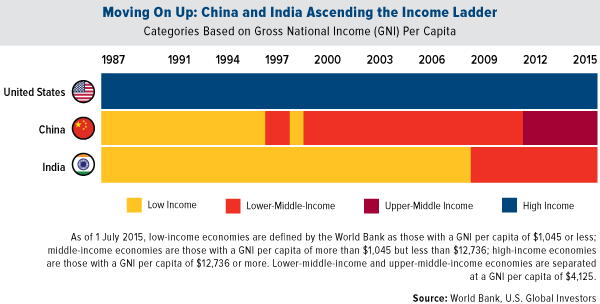 Four years later, we saw China and Asia starting to take off and GDP per capita rise. This is an important factor in this whole run-up that I would characterize as the Love Trade. 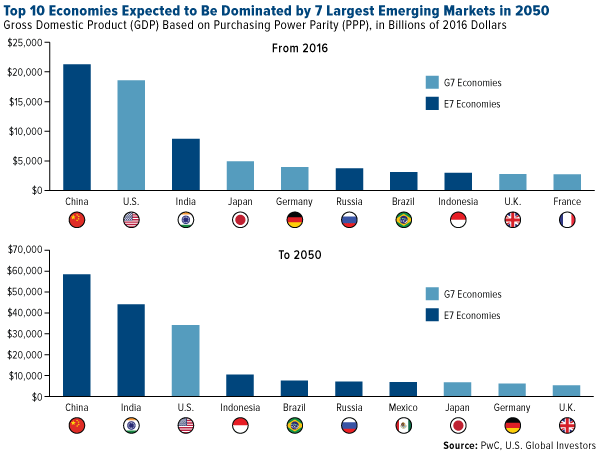 A strong correlation is rising GDP per capita, and in China, India and the Middle East, they buy gold and many gifts of love. We saw the Fear Trade starting to take place after 9/11. The biggest factor behind the Fear Trade is negative real interest rates. So when you had both—negative real interest rates and rising GDP per capita in the emerging countries—you had gold demand going to record numbers. At the very peak of 2011, the dollar had just been basically downgraded by Moody’s and we had negative interest rates on a 10-year government bond. It was a record negative real rate of return, like in the ‘70s. You saw this spending from the Fear Trade, but this Love Trade was in negative real interest rates. Since then, the U.S. has gone positive. But we’re seeing that in Europe, gold is taking off in euro terms, and in Japan it’s taking off in yen terms. They’re running at negative real interest rates the way we were on a relative basis up to 2011. Q: So would you define this bear market as a cyclical bear market, a correction in a long-term trend, or would you define it as secular very much in the way that we experienced the price of gold between, let’s say, the 1980s and 1990s? A: I think that we’re wrestling with something else. When we look at the other basic metals, what drives the demand for iron, copper, anything that makes steel? It’s fiscal policies. Huge infrastructure spending and fiscal policies. What’s happened since 2011—and after the crash of 2008 but particularly in 2011—is that when the G20 central bankers get together, they don’t talk about trade. It’s all about tax and regulation. 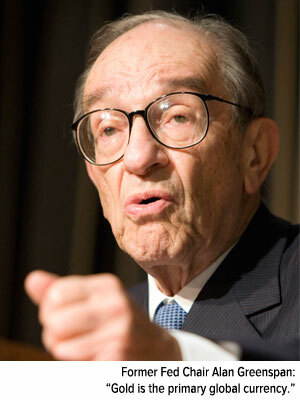 They have to keep interest rates low to try to compete, to try to get exports up, to drive their economies. That is a big difference on the need for all these commodities, and it seems to have ended the bull market. Until we get global fiscal policies up and increase infrastructure building, then I have to turn around and look the other way, and say it’s going to take a while. I do think that gold is going through a bear market. A lot of it has to do more with the central bankers and everything they try to do to discredit gold as an asset class, at the same time try to keep interest rates low to keep economic activity going strong. That’s been a much different factor in driving the price of gold. The other thing that’s been fascinating is this shift of gold from North America to Switzerland to China. 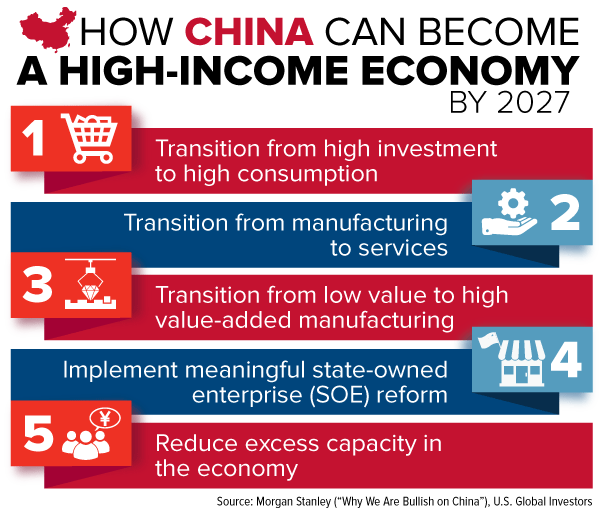 The Chinese have a strategy for the renminbi. Not only do they have 200 million people buying gold on a monthly program throughout their banking system, but the government is buying gold because it needs to back the renminbi to make it a world-class currency of trade. Q: Explain two things: one, why we never saw the hyper-inflation that people thought we were going to see with the massive amounts of quantitative easing (QE), and two, investor preferences changing from hard assets into stocks. A: Well first of all, a lot of money didn’t really go directly into the economy. We never had a huge spike in credit supply in 2011, ’12, ’13. Only in ’14 did we start to see it really pick up. We never got this big inflation some expected because the money is so difficult, outside of getting a car loan or an extension on a house. Even Ben Bernanke, after he left the Federal Reserve, had trouble refinancing his house following his own procedures. It’s extremely onerous to get a loan. I think the biggest part is to follow the money. And where is the money going? It’s showing up in stocks. When I look at gold stocks, it’s amazing to see that the indexes are down since 2011, but a basket of the royalty companies is positive. So why is money finding its way to them? What are the factors driving that? Well, not only do they have free cash flow, but they also have a higher profit margin and they’ve been raising their dividends. Franco-Nevada again just raised its dividend. Since 2011, the dividend yield on Franco-Nevada and Royal Gold has been higher than a 5-year government bond and many times higher than a 10-year government bond. So money all of a sudden starts going for that yield and growth. Q: What’s happened to the industry since the downturn began in 2011? A: Well, when you take a look at the big run we had until 2006, we had very strong cash flow returns on invested capital. We had expanding free cash flow. And then a lot of the mining companies lost their focus on growth on a per-share basis. They kept doing these acquisitions, which made a company go from “$1 billion to $2 billion in revenue.” However, the cost of that meant that there was less gold per share in production and there were less reserves per share. You had this run-up in the cost for equipment, for exploration, for development. The result was you had seven majors lose their CEOs. And in the junior to mid-cap size, you probably had another 20 in which management was thrown out. The new management is much more focused on capital returns. They have to be. Otherwise they get criticized. That will hold a lot of these managements accountable, and I think that’s very healthy. And now it’s starting to show up that the returns on capital are improving for several of these companies. Q: What would you be doing with money right now if you were to be in the gold market? How much would you put in the gold market? How would you have that money invested. A: I’ve always advocated 10 percent and rebalance every year. Five percent would go into gold bullion, coins, gold jewelry—you travel around the world and you can buy gorgeous gold jewelry at basically no mark-up compared to the mark-up on Fifth Avenue. The other 5 percent is in gold stocks, and if it’s a basket of these royalty companies, I think you’ll do well over time, and you rebalance. If not, then you go to an active manager, like we have. Speaking from a buyer’s position, Ralph Aldis— portfolio manager of our Gold and Precious Metals Fund (USERX) and World Precious Minerals Fund (UNWPX)—is a TopGun ranked in Canada as an active manager. Q: Explain your caution in terms of gold in the percentage you recommend. A: I’ve always looked at gold as being a hedge from the imbalance of government policies. Having that 10-percent weighting and rebalancing every year might help protect your overall portfolio. There are many studies going back 30 years that show that rebalancing helps. It’s also advisable to put half your money in dividend-paying blue chip stocks that are increasing their revenue. When there are great years in the stock market, people often take some profits. And when gold’s down, as it is now, it might be time to put money in gold and gold equities. For more, listen to the entire interview. These are among some of the findings released in a study conducted by resource company strategist MinEx Consulting, which analyzed the performance of explorers and producers operating in Canada between 1975 and 2014. What the consultancy firm found is that, in the last decade, junior companies were responsible for more than three quarters of all new mineral discoveries and were approximately 30 percent more effective than senior companies at generating wealth. Ralph Aldis, portfolio manager of our two precious metals funds— the World Precious Minerals Fund (UNWPX) and Gold and Precious Metals Fund (USERX), which holds four stars overall from Morningstar, among 71 Equity Precious Metals funds as of 3/31/2015, based on risk-adjusted returns—agrees with the results of the study. In a March interview with The Gold Report, he noted that junior gold producers “have the flexibility to be able to adjust” to varying commodity-price conditions. “It’s the smaller, midsized companies that have a better handle on their operations,” Ralph said. A good example of such a small-cap miner would be Claude Resources Inc., which we own in both USERX and UNWPX. Claude, the only producer operating in Saskatchewan, Canada, managed to turn its operation around fairly quickly after netting a huge loss of $73 million in 2013. The company just reported a profit of $4.6 million in 2014, driven by “record production performance,” according to President and CEO Brian Skanderbeg. For the one-year period, the company is up a phenomenal 216 percent. 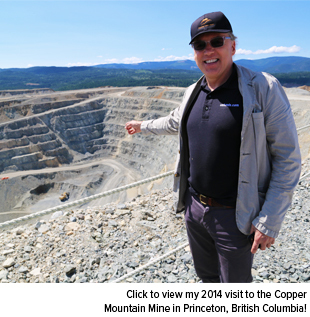 “Claude has been around for a long time, but its new management understood that it had to change its mining method, which has made a big difference,” Ralph said in The Gold Report. Junior companies have increasingly played an essential exploratory role in Canada. Nearly 40 years ago, they were responsible for only 5 percent of all capital spent on exploration; by 2007, that amount had ballooned to more than 65 percent. Over the past decade, juniors have accounted for 54 percent of all spending on exploration in Canada. As a result, major producers have steadily lost ground to the smaller players in terms of discovering new mineral deposits. In three of the previous 10 years, in fact—2009, 2010 and 2012—senior companies failed to make a single new discovery. Quality or Quantity? How about Both? Not all mineral deposits are created equal, of course. Some might be all a producer needs to be successful, whereas others aren’t even worth the time and capital to develop. You can think of a Tier 1 deposit as a “company making” mine—one that might yield up to 250,000 ounces of gold per year over its lifespan of 20 years or more. Some of these projects can easily be valued at over $1 billion. Finally, a Tier 3 deposit is considered marginal, valued at anywhere between $0 and $200 million. About 80 percent of the mining industry’s wealth is generated from Tier 1 and Tier 2 projects. But such discoveries, as you might imagine, are muchrarer than Tier 3s. To give you an idea of just how rare they are, consider this: Every decade in Canada, the industry discovers on average 40 Tier 3 deposits, seven Tier 2 deposits—and only three Tier 1 deposits. So how do the juniors stack up against the seniors when it comes to finding quality mines? In the table below, you can see that they’re running slightly behind. In the past decade, juniors made 7.3 Tier 1 or 2 discoveries in Canada, compared to the seniors’ 8.7. This news bodes well for our two precious metals funds. 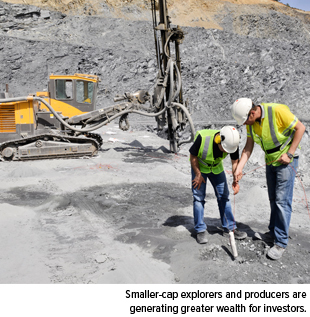 Although they both invest in junior explorers and producers, the Gold and Precious Metals Fund also allocates assets to the large-cap, senior mining companies. Not only that, but Canada is the top investment destination in both funds: 57 percent in USERX, 77 percent in UNWPX. Canadian mining companies have lately seen margin expansion because the majority of their costs are in the relatively weak Canadian dollar, yet they sell their commodities in the strong U.S. dollar. According to MinEx, 19 percent of the world’s high-quality Tier 1 and 2 mineral discoveries were made in Canada between 2005 and 2014. That’s second only to the entire continent of Africa (25 percent). The country’s mining industry also has an estimated value of $19 billion, or 21 percent of total valuation worldwide. At 0.77, Canada’s value-spend ratio, or “bang for your buck,” was better than the global average of 0.67. Following the recent Federal Open Market Committee (FOMC) meeting, Federal Reserve Chair Janet Yellen made it clear (again) that interest rates would not be raised until inflation gains more steam. With current inflation rates negative for the first time since 2009, and with the U.S. dollar index at an 11-year high, we can probably expect near-record-low interest rates for some time longer. In September 2011, when gold hit its all-time high of $1,921, the dollar index was at a low, low 73. With the dollar having recently broken above 100, although since fallen back a little, the yellow metal sits under a lot of pressure. However, I’m pleased at how well it’s held up compared to the early 1980s, when gold plunged 65 percent from its peak of $850 per ounce as the U.S. currency began to strengthen. Frank Holmes’ take on the huge pre-Chinese New Year demand figures as shown by the Shanghai Gold Exchange where withdrawals in the first six weeks of the year have totalled a ‘mind-blowing’ 374 tonnes. Frank Holmes of U.S. Global Investors gives us his views on investing in African mining following his vist to Cape Town last week for the Mining Indaba and what governments need to do to help encourage it. Last week I attended the Investing in African Mining Indaba in Cape Town, South Africa, as both a presenter and a student seeking opportunities. 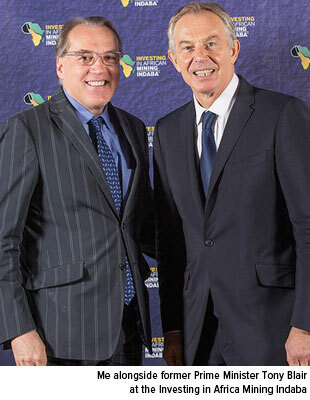 One of the highlights of the conference was former Prime Minister Tony Blair’s keynote address, during which he offered some crucial advice to African governments: To attract and foster a robust mining sector, a commitment to fiscal stability must be made. Since 2009, Blair has run the Africa Governance Initiative, which counsels leaders in countries such as Rwanda, Sierra Leone, Liberia, Guinea and others. Simply put, without fiscal stability and predictability in taxation, capital will be unwilling to flow into any country—African or otherwise—for exploration and production. If a government changes its tax policy every three years or so, that instability discourages the inflow of financing. This is bad for Africa. I shared the following map last week, but it’s worth showing again, as it supports Blair’s point. Central and Southern Africa, especially, are extremely commodity-rich and maintain a large global share of important metals and minerals such as platinum, diamonds and gold. 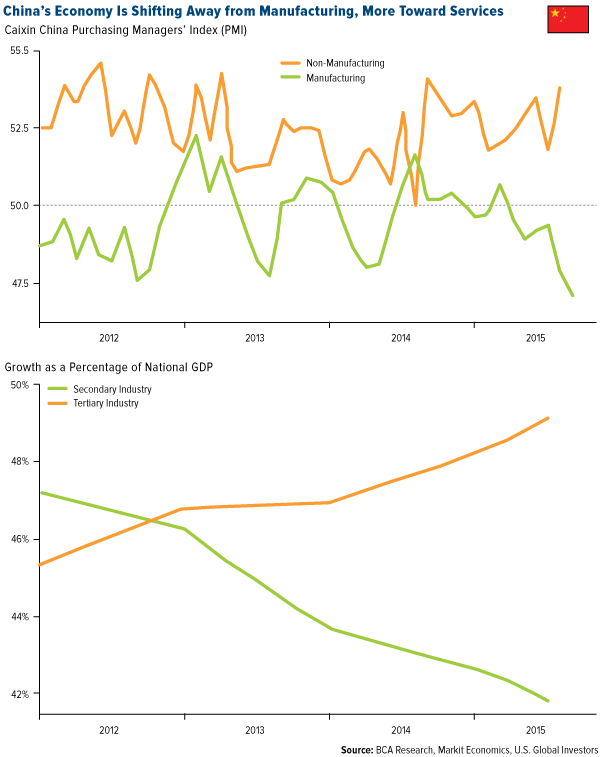 Fiscal instability is also bad for investors in Africa. If foreign investment is not respected by a government, if it is punitively taxed or arbitrarily confiscated, further investment will not flow into that country. Politically, African nations need to recognize that seemingly faceless investment institutions represent real people’s hard earned dollars. In Zambia, for example, a huge 12 percent of the country’s GDP comes from mining, an industry that employs 10 percent of all Zambians. Yet its government has increased, rather than cut or at least eased, restrictive royalty taxes on mines. In the case of open pit mines, royalties were raised from 6 percent to a crippling 20 percent. Speaking to Reuters, a mining industry spokesperson speculated: “Mining companies are not going to put another dollar in [Zambia]” if the government continues to be unreliable. This is proof positive of what I frequently say: Government policy is a precursor to change. In the example above, the tax policy is leading to change that could very well hurt Zambia’s economy. With mining being such a strong contributor to its GDP, it seems the government would want to make it easier, not more challenging and costly, for international producers to conduct business there. The less friction and fewer disruptions there are, the easier it is for money to flow. But Zambia’s isn’t the only African government that’s placing roadblocks in front of miners. The Democratic Republic of Congo is in the early stages of hiking royalties on mines and revising its mining code. And in his recent State of the Nation Address, South African President Jacob Zuma announced that foreigners could no longer own land in the country, which raises the question of what implications, if any, this might have on U.S. and Canadian companies that own and operate South African mines. Zuma’s announcement comes at a time when persistent electricity shortages have stymied mining activity and rumblings of a miners’ strike similar to the one last year that brought platinum and palladium production to a five-month halt are intensifying. At the same time, many governments in Africa are waking up to see that they’re going to have to provide the sort of stability and consistency Prime Minister Blair outlined if they hope to attract the capital necessary to fund and develop their mining opportunities. A strong mining sector doesn’t just benefit the native country, either. It’s a global good that benefits all. In another presentation at the African Mining Indaba, Terry Heymann of the World Gold Council convincingly showed that the economic output of the global gold mining sector far exceeds the collective aid budget of world governments. Gold mining, he said, created and moved as much as $47.3 billion to suppliers, businesses and communities in 2013, compared to governments’ $37.4 billion. Our doctors, the Randgold doctors, run a technical committee meeting every day where we coordinate with the [Malian] health authorities, and we help manage the deployment of energy. Now that we’ve eradicated the second [Ebola] outbreak, our big focus is on prevention and education. We were part of the Neglected Tropical Disease Initiative rollout… We’re very big on the AIDS programs around the country. We brought the malaria incident rate around our mines down by more than four times. 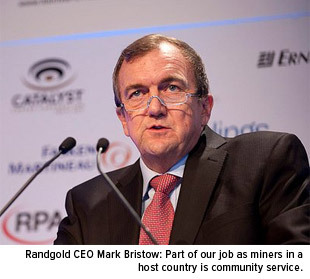 Because Randgold is the largest employer in Mali, Bristow suggested, he feels a moral obligation to partner with his host country and make it a healthier, safer place to live and work. During the same interview, he insisted that Randgold, which we hold in our Gold and Precious Metals Fund (USERX) and World Precious Minerals Fund (UNWPX), has a “solid five years ahead of us,” citing the fact that the company holds no debt and managed to replace all the ounces it mined in 2014 at $1,000 long-term gold price. It also increased its dividend 20 percent. Despite bullion’s price hovering just above the relatively low $1,230 range, Randgold has delivered 16 percent year-to-date. This is in line with gold mining stocks in both the NYSE Arca Gold Miners Index and FTSE Gold Mines Index, which are outperforming the return on bullion. As I mentioned back in July, when mining stocks do well, bullion has tended to follow suit. This also shows that producers are successfully adjusting to a $1,200-per-ounce environment by scaling back on capital spending, selling off assets, putting exploration on hold and engaging in mergers and acquisitions—which in the past has signaled that a bottom in spot prices might be reached. B2Gold Corp. closed on its deal to buy Papillon Resources in October; we learned in November that Osisko Gold Royalties is taking over Virginia Mines; and last month it was announced that Goldcorp would bepurchasing Probe Mines. Mark Bristow has just hit the ball out of the park. He benefits from a weak Mali currency and he benefits from a weak euro because everything is priced in euros. He’s also benefited from weak oil prices. Indeed, many miners not operating in the U.S. are the beneficiaries of a weak local currency. The West African CFA franc, Mali’s currency, is off 20 percent; the South African rand, 40 percent; the Canadian dollar, 15 percent. Low energy prices are also helping gold producers, just as they’re helping companies in other industries, airlines especially. 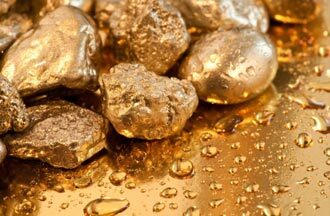 In most cases, fuel accounts for between 20 and 30 percent of gold miners’ total operating costs. Because Brent oil is currently priced around $60 per barrel, gold producers are seeing significant savings. This Thursday marks the Chinese New Year, a traditional occasion for gold gift-giving. 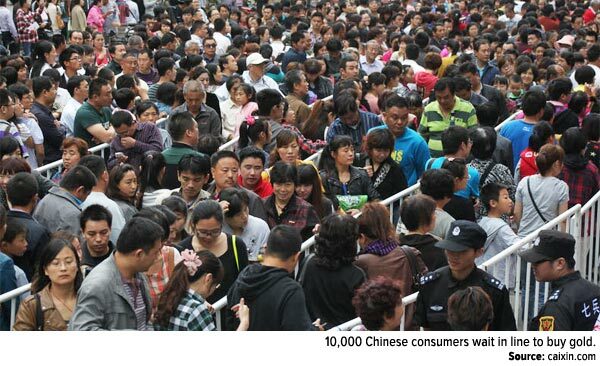 Chinese demand for the yellow metal was strong in 2014, as 800 tonnes flowed into the country. Over half of the global gold demand, in fact, was driven by the world’s two largest markets, China and India. When you look at real interest rates out of the G7 and G10 countries, the only one with a modest increase is the U.S. dollar. Any time you get this negative real interest rate scenario, gold starts to rally in those countries’ currencies. Now what’s really dynamite is the gold mining companies like Goldcorp, which pays a dividend higher than a 5-year government bond. LBMA Gold price end 2013: US$1201.50; Gold price end 2014: US$1199.00. LBMA Gold price end 2013: US$ 1201.50; Gold price end 2014: $1199.25 – only down a minute 0.19% over the year Thus, by effectively marking time vis-a-vis the US dollar over the full year gold outperformed virtually all other currencies in maintenance of value. Frank Holmes of U.S. Global Investors pointed this out neatly with the graph below in a recent article – but maybe he jumped the gun a little producing the graph just before the final year-end London gold price was set, with gold making a small recovery in the interim to bring it even closer to its 2013 closing figure (LBMA Fix – or London Gold Price as it is now called). However, the spot price did fall back to the $1180s after the final London price for the year was set. Indeed its LBMA afternoon price on December 30th at $1206 was actually 0.4% higher than its 2013 close but something of a dollar rally on the morning of the 31st brought it down a little. See Frank’s chart below comparing key currency performance with that of the U.S. dollar over the year. To read his full original article click on Gold Beat All Other World Currencies in 2014. Most gold investors will probably have considered 2014 a poor year with gold making early-year moves upwards before coming back down again in the latter part. But if one looks at the strength of the US dollar (or perhaps this should be the weakness of other currencies vs the dollar) with the dollar index rising 12.4% over the year, an investment in gold in any other currency will have seen an increase of above this percentage over the year. And if one lives in Russia or Argentina the percentage increase would have been large indeed! Gold has thus, over 2014, performed extremely well as a wealth protector. As an example – in Swiss Francs the gold price actually rose 9.5% over the year. 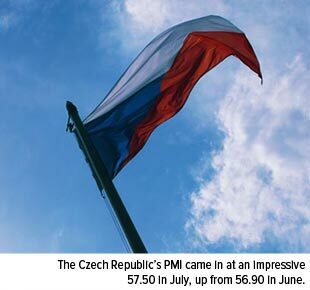 In the Russian ruble it rose no less than 77% over the period. Perhaps we are far too focused on gold’s US dollar performance to see its real value for those outside the USA. Sometimes one needs to take a step back and look at other valuation parameters. For the time being at least, gold seems to have found a price equilibrium at, or around the $1200/ounce level. 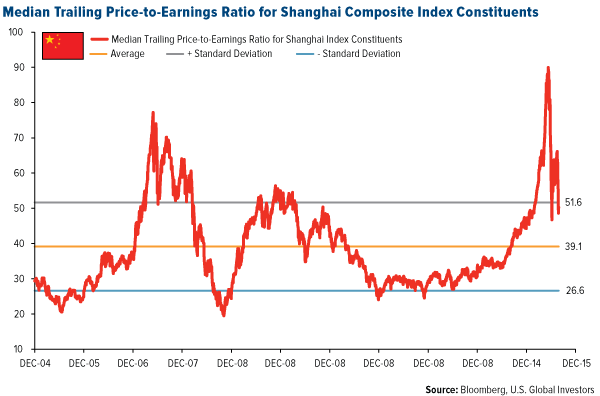 We might argue that this is the kind of level China is comfortable with – see: Path of the gold price is in China’s hands. Whether China is, or is not, keeping the price at this level is obviously open to speculation, but it certainly has the capability of so doing and with so many of its citizens holding gold it may well have a strong interest in keeping prices relatively stable. It is also widely believed that China is building its national gold reserve without reporting it to the IMF, and that this gold reserve is now very comfortably above the official 1,054 tonnes which it has claimed to have had for the past six years since its last upwards valuation. But this again remains as speculation until and unless China reports another reserve increase. The thought is that it may refrain from doing so until its gold reserve matches the official reserve of the U.S.A. north of 8,000 tonnes. By comparison, silver investors have had a pretty dismal year. Of the countries featured in Frank Holmes’ chart above, only silver investors in Russia and Argentina will have seen value protection in their own currencies. Again, as we pointed out here recently silver investors take much more of a gamble than those investing in gold given the white metal’s vastly increased volatility over its yellow sibling. See: Silver in 2015 – the gambler’s precious metal. But even so, this year’s silver price performance, or lack of it could be considered remarkable vis-à-vis gold with which it usually has a closer relationship. By many calculations silver is currently in a supply deficit, but this seems to have had no positive effect on price movement. The key price drivers at the moment are purely speculative and as a much smaller market than gold, speculators have a far easier path to price manipulation than gold – and the general belief nowadays is that the gold price is being manipulated too by mega-money players. If the manipulation premise is correct, then the gamble therefore with silver is in picking the point at which the speculators change tack to make huge profits on an upturn. Maybe this point is near, but relying on this is not for widows and orphans.